1. I woke up the other day and my phone alerted me that Google+ completed my year in review video. It's actually pretty cool. Thanks, phone, for crafting this message for me. It was actually really cool to see all the things I did this year: Fort2Base Race, Chicago Wine Riot, our trip to Austin, the Peoria Marathon Relay, Ragnar and a few work things, too. 2. Santa spoiled me. As always. He must not know I wasn't that good. 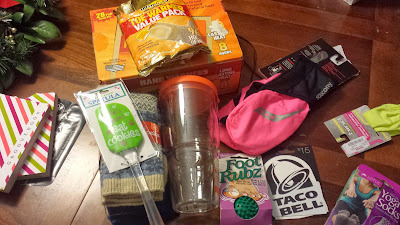 I love that Santa knows that running gear and Taco Bell gift cards will always go over well in my book. That spatula says "Life is Short. Eat Cookies"
3. My parents are too cute. In addition to inadvertently dressing in coordinating outfits for Christmas, they also bought each other matching slippers from the same company, unplanned. These crazy kids are meant to be. 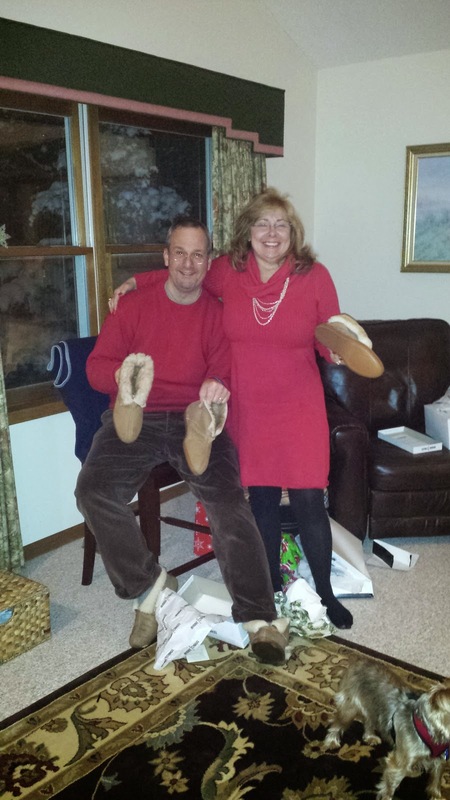 looks like an awesome Christmas, your parents are adorable! Looks like an amazing year and an amazing Christmas! Hope your holidays have been nice apart from the xmas presents! I loved my slideshow! Glad I showed up in yours a few times lol!